To view this email as HTML click here. Those are among the Dakota County Regional Chamber of Commerce's priorities. 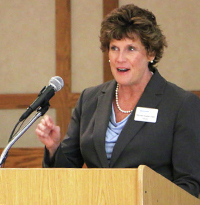 Maureen Scallen Failor, the organization's new president, said she will work to ensure that local businesses are assets in communities and in the state, providing jobs and contributing to the tax base. Get the full story here. We Are Committed to Business ... for YOU. The session is scheduled to conclude today, Monday, May 21, 2018. Will our legislators get the job done? Please join us on Friday, June 1, 2018 to hear from members of the Dakota County Legislative Delegation. Members will provide their ... click for more. Keep Up-to-date on MnDOT construction projects for Dakota County click here. The Minnesota Zoo is celebrating #40YearsofAmazing. It has welcomed more than 43 million guests from around the world since opening on May 22, 1978. The zoo functions like a small city and is home to more than 4,800 animals. These animals represent 515 different species, 64 of which are currently listed as threatened or endangered. Last year the Zoo’s Zoomobile, staffed with its team of trained naturalists and a few animals, traveled to 43 counties in Minnesota, reaching approximately 50 thousand participants. Enter the login name and password to gain access to your companies member site to update information and take advantage of all the marketing tools that come with your membership. www.chamberlogin.com. This email was sent on behalf of Dakota County Regional Chamber of Commerce by GrowthZone, 24400 Smiley RD Ste. 4, Nisswa, MN 56468.To unsubscribe click here. If you have questions or comments concerning this email or GrowthZone services in general, please contact us by email at support@growthzone.com.